Ok, I'll start this review off by being totally and utterly honest - I'm biased. I've been on the Clarisonic bandwagon for about six years and feel like it was an investment piece well worth the money. And if mine broke tomorrow, I'd be online buying another one in a blink of an eye. I never want to be without it...obviously. That being said, I will also say that this enthusiasm was primarily based on that fact that I simply believe it cleans my face better than I do with my hands. I know, earth shattering, right? I could go a night or two without using it, but then I felt like my skin was building up with ickiness. So trust me, as simplistic as my reasoning was at the core, I still valued whatever the Clarisonic did, just that much. So much so, that a couple years ago I took a four day summer trip to D.C. and forgot it (the horror!) and because I could not be without the feeling of being "scrubbed" I headed to the Sephora in Georgetown and bought one of those little complexion brushes for about $5. It semi-quelled my separation anxiety, but it was NOWHERE near the same. Now, despite my admission that I'm biased, I still have to tell ya that I've fallen in love with my Clarisonic all over again. Even though I've used the Delicate, Sensitive and Normal brush heads in the past, I never felt that any of them were quite the one for my skin type. About a month ago I decided to pick up a replacement brush, and initally debated between the Deep Pore cleansing one and the new Acne brush. 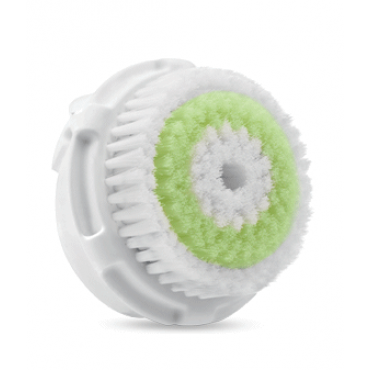 The design focus of the Acne brush is geared toward concentrated pore cleansing and acne prone skin. 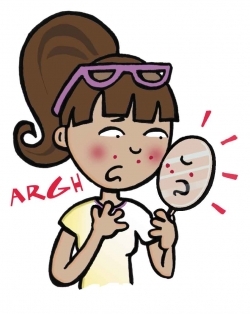 Read: big, clogged pores and breakouts. Hello, that would be me. So ultimately, I'm sure I was more than a little influenced by the massive, angry, red, pulsating pimple that had taken up residence on my cheek at the time. But I'm thrilled that I bought the one I did. I'm so pleased with what this brush does to my skin, that I actually look forward to washing my face every day. Seriously, like I'm excited about it and might even wash my face way before bedtime if I'm not going back out. My skin just feels really refreshed and clean after using it. I do use it twice a day and the only way I skip a use is if I'm forced to because it needs charging. Now, I'm not implying that this brush has rid me of breakouts and zits, but because this head has denser, plusher bristles giving a deeper pore cleanse, it brings residue to the surface and makes it super easy to perform extractions. Which in turn, keeps that clogged pore from evolving into some nasty monster. Even when I do begin to get an under the surface blemish, I believe this brush has cleaned my pores so thoroughly that it permits my acne treatments to perform better, thereby ending the blemish sooner and making it much less of a problem.